Happy Friday, everyone! If you’re off to a fancy party this weekend, I hope you look as amazing as this Prima doll! 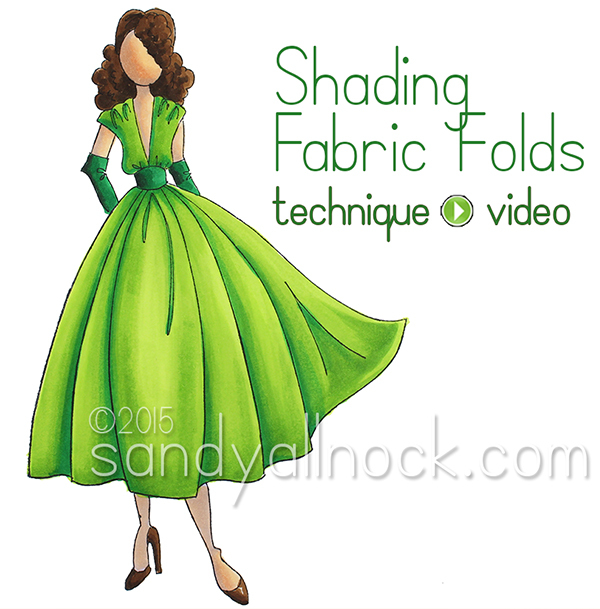 If you’re at home in pjs like me…enjoy a little lesson on shading fabric! Fabric folds give lots of people fits – it billows in and out of the light so much that it can be hard to figure out where to put the darks. This is a quick overview of a way to think through the lighting – watch the video below or click HERE to watch in HD on YouTube! 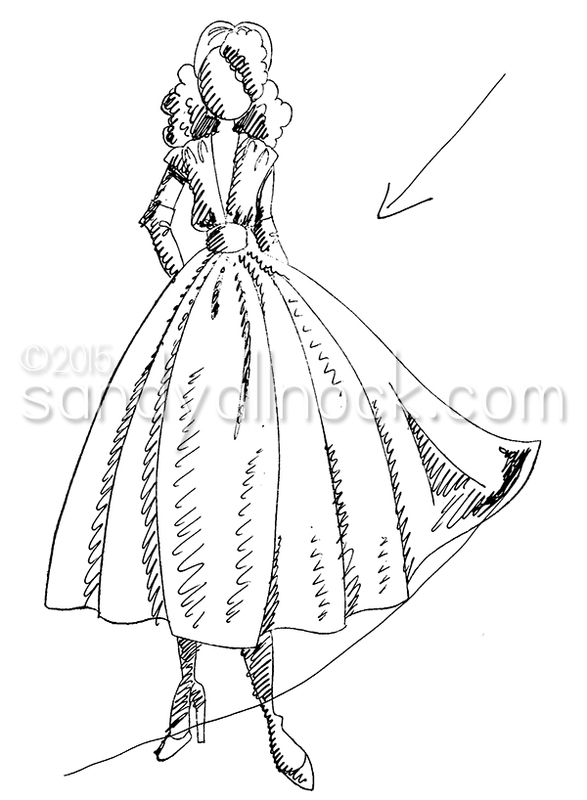 If you pick up this stamp – you can use the sketches below to try this yourself! Or pick another stamp you have and make yourself a stamped cheat-sheet on scratch paper, and store it in your stamp pocket (I use these and LOVE them) for use later on! This one shows the lighting from the upper right as shown in the video. And this is the opposite direction, lighting from the upper left. 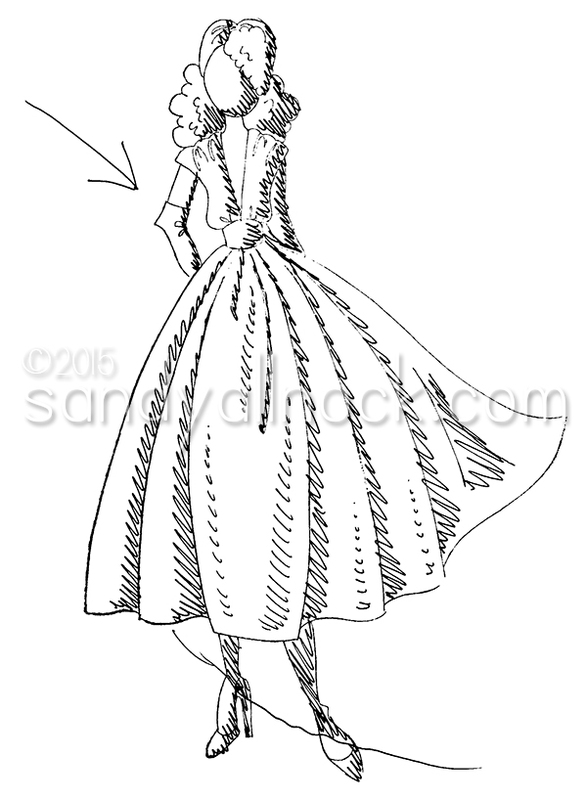 Shading fabric doesn’t have to be difficult, it just takes some practice! PS Don’t forget the giveaway HERE! If there are stamps that you think would make a good lesson on shading fabric, leave me a link in the comments – if I get the stamp I’d be happy to include it in my long list of oh-I-can’t-wait-to-make-a-video-with-this! gorgeous!!! Can practically see the movement in that skirt!! Sandy, you are so ridiculously talented! Its just NOT FAIR! LOL That is just amazing to watch. A BEAUTIFUL job! I’m back again. Will you show the completely finished picture soon with the shadow added at the bottom? I’m curious about how you were going to do that. Thanks Sandy. Amazing video! Although I do pencil and watercolor, I learn so much from watching your approach with Copics. Thanks for all of the detail! Thanks so much for sharing this! Great way to determine where to put your shading! Thanks for sharing this. I’ve been enjoying all the other techniques you’ve been showing, but I was missing your Copic magic. Really looking forward to the upcoming videos! Thanks for another wonderful technique video, Sandy. Have a wonderful weekend! I agree with one of your followers on YouTube … You make any tool you are holding perform magic. Thank you for sharing your knowledge and talent. Great lessons! I love the idea of sketching shadows and light source and keeping it with the stamp! Ahhh – just what I needed! Thank you for showing fabric folds with Copics – and looking forward to whatever it is that you’re bringing out “in the next couple weeks”!!! You’re work is always so amazing.